Finally! 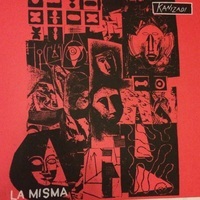 After a year and a half of waiting for a proper follow up to their excellent debut 7", NYC's La Misma return with their debut LP. To cut to the chase, I'm shocked at the level of improvement from the 7" to this. The 7" was great, but this record might just be a masterpiece. There is a far more dynamic approach to the songwriting and flow of the record that really stands out. On some of the slower songs, you would possibly think that you're listening to the best (unintentional) post-punk record of the year. Every element of the band is excellent, of course, but what TRULY stands out are the guitar parts, which are the best NYC punk (or American punk) has to offer in 2015. As always, the packaging is the best in the game. The covers are actually red and not purple (that's the Euro color), which I think is a better look! Essential.